Draft at Blue Moon in York, PA. Pours an attractive clear golden amber with a modest off-white head. I inital impression is mild maltiness - toast, caramel, and roasted biscuit. Medium mouthfeel; fairly high carbonation. Finish is quite dry - TOO dry for my tastes. Overall, an OK but not compelling APA. Nothing interesting here, kind of bland ,like a light beer. OK but not good enough to earn a repeat. Have a few more more of these so i may update this review. Nice basic APA with biscuit, toasted grains, caramel, floral hops, herbs, light grapefruit, lemon, wheat or cardboard and faint peppery spices. The aftertaste is too herbal and takes away from the hop sweetness that started the flavor off the right way, but it's still pretty easy to drink. From the bottle: "In the early 1900s the American Railroad was the backbone of this country. With remnants of an old railroad directly next to our brewery, we found it fitting to brew a beer which pays tribute to those that traveled the rails. Hopped five times exclusively with Citra Hops, this pale ale delivers a robust aroma with hints of melon, grapefruit and passion fruit. 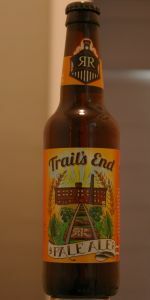 The clean finish of this ale makes it a fitting session beer for whichever trail you choose to travel." I Pop!ped the cap but due to foaming, I kept my pour kind of light, but I still ended up with two fingers of dense, rocky, tawny head with decent retention. Color was a slightly hazy solid Amber (SRM = > 7, < 9). Nose definitely gave off grapefruit and a faint melon sweetness, but I was not getting passion fruit. Mouthfeel was medium, very carbonated. The taste was fairly bitter for an APA, very much grapefruit, but almost like the beer was saturated with hops and the malt given short shrift. The finish left a dry, dusty coating in my mouth, like I had been sucking on an aspirin tab. It was clearly overhopped to the point of saturation. Finish was dry and bitter, but even as a self-avowed, self-described hophead, it was a bit too much for me. Poured into a narrow glass: color is copper, nicely transparent, fine bubbly effervescence; head is light tan with a dense fine to small bubble size with a great lingering quality - at least 1/2 inch thick 15 minutes after the pour. Smell is a bit subdued, mild malt, toast, light biscuit touch of earthiness. Taste is very pleasant, with a lean towards mild ale style as the maltiness is a bit sweet; flavors are toast, caramel, mild maltiness, biscuit; hop bitterness is light at first but then stronger on the back end with an earthy/grassy presence, touch of lemon/citrus. Mouthfeel is a bit crisp, highly carbonated, and dry on the tongue with a mouthfeel that reaches toward the mild ale/ESB style. Overall - a solid malty APA with a nice lingering sweetness and toasted flavor; hops are mild and carbonation is high. I had this on draught at the brewery. It poured a hazy amber color with a nice milk white head and lacing. The smell was rather subdued: biscuit, pine needles, and hops. The taste features lemon peel, biscuit, and light hops. It is crisp and slightly bitter. This ale is quite light in body, moderately carbonated, and very easy to drink with an ABV of 5.4% Overall, it is a well-brewed Pale Ale.